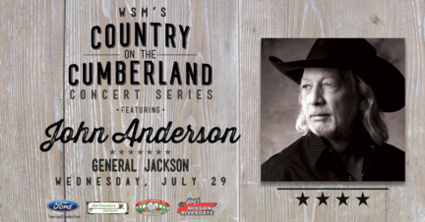 John Anderson will perform his first acoustic concert in Nashville in over 30 years on July 29, as the first guest on the inaugural “Country On The Cumberland” series presented by 650 AM WSM. The special event will take place aboard the General Jackson Showboat as guests cruise down the Cumberland and enjoy a dinner with the intimate show. Anderson will perform songs from his new CD Goldmine, which was released May 26, along with favorite hits. The new series is being held as part of WSM’s 90th Anniversary celebration, and the station will spotlight a different artist for each show from July through October. Listeners can purchase tickets to the Country On The Cumberland shows via wsmonline.com.